The study of similarities and dissimilarities in material culture is the essential basis upon which the Culture-Historical approach to archaeology rests. In Central and Eastern European Archaeology concepts derived from this tradition are still very dominant, while it has been largely abandoned in Anglo-Saxon Archaeology. Yet alternatives for the study of the spatial stylistic variation in material culture have not been properly developed, despite the promising start made by D. L. Clarke (1968) in his work “Analytical Archaeology”. In consequence, we still have to live with spatial archaeological units of classification – our traditional “Archaeological Cultures”, which are poorly defined and heavily biased by outdated concepts about ethnicity (Veit 1989). Most modern archaeologists are well aware that these cultures are no more than heuristic tools for classification and do not equal groups of social identity (cf. Lüning 1972). Nevertheless, these problematic concepts mentioned still enter through the back door of classification habits. By definition (Childe 1929) “Archaeological Cultures” are units that presuppose cultural coherence and connote a homogenous social group represented (cf. Wotzka 1993; Wotzka in print, Shennan 1989; Jones 1997). 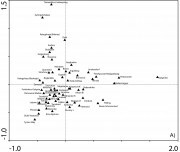 A polythetic classification that allows for diverse distributions of the different categories of material normally reveals a non-coherent setting of different types in the archaeological record, indicating that most of our Archaeological Cultures are more or less crude approximations of past cultural relations. Ever since the acknowledgement of these problems, alternative classification concepts have become available (Clarke 1968; Lüning 1979) and applied to Neolithic material (cf. Müller 2001; Furholt 2009). If the spatial variation of stylistic traits in material culture is of any interest for our understanding of past cultural reality (as I definitely do believe), then we need a renewed debate on the method of representing this variance. Besides the aforementioned classification issue, it seems evident that an approach that is based upon judgements towards the similarity and dissimilarity of material culture needs some form of quantitative background. The comparison of one culture against the other forwards absolute statements about regional contacts that cannot easily be differentiated. Often single finds are ascribed as indications of cultural contacts without adjustments in regard to the total quantity of material in the contexts involved. Surely qualitative considerations concerning the different significance of individual artefacts are important, but they should be combined with considerations concerning quantitative relations. When we discuss the similarity and dissimilarity of material culture, a quantitative approach should be able to create a set of data that allows for judgement on the scale, dimension and degree of similarities. This has the potential of leading away from a binary yes-or-no framework and towards a comparable and computable assessment of cultural similarities. The increased availability of database systems and statistical procedures (Shennan 1997), together with Geographical Information Systems (GIS; Burrough/McDonnell 1998) allow for the assessment and processing of great amounts of data, as is present in archaeological literature or in the countless archaeological repositories all over the world. Instead of talking about cultures, we can register the stylistic traits of each artefact, geo-reference it, date it and compare it to every other artefact available. This is, of course, a theoretical statement, but it gets realistic when proper sampling strategies are taken into account (Orton 2000). Comparable and inspiring approaches have been carried out towards the Central European Iron Age (Müller-Scheessel/Burmeister 2006; Nakoinz/Steffen 2008). It should be clearly stated that such a quantitative approach to stylistic variation in material culture does not provide a more objective assessment of cultural patterning than the traditional, non-quantitative ones. It is, of course, no more than a procedure to formalise our evidence and to compare our data excavated, processed and published (and, thus, subjected to a series of subjective filters). The formalisation makes the data comparable, and the quantification allows us to go beyond absolute statements like “Site A is similar to Site B, but very different from site C”. Indeed, it provides us with the possibility to tell how similar Site A is to Site B and how marked the differences are compared to site C (see fig. 1). Nevertheless, as a discipline of the humanities, we have to use theories and build plausible models that must be confronted with empiric data. In a cultural communication model these similarities in style may be interpreted as equivalent to the cultural proximity between the different producers of the objects, a proximity that will be very close to the actual amount of communication between these persons. In a culture-theoretical perspective, such communication does not take place in one single realm of a coherent culture. Instead it is connected to different cultural collectives, which show different ranges and overlap, as every individual is involved in several different collectives due to different social roles he/she is engaged in (see Hansen 2003). These cultural collectives can be viewed as spheres of cultural communication that have a polythetic setting, thus meeting the argument for a polythetic classification of the archaeological record. It should be legitimate to associate different categories of archaeological find material with such different spheres of communication (fig. 2; cf. Müller 2001, 40). It is conceivable to regard, for example, metal objects as being associated with different social spheres and having a different spatial range than pottery, whereas burial rites again are communicated through cultural collectives that may differ from those of prestigious metal objects or homemade pottery (fig. 2). This means that we will first quantify the similarities and dissimilarities for each cultural sphere and, second, compare these datasets in order to reconstruct patterns of communication intensity and the relations between the different cultural spheres in a model of socio-cultural interaction. In order to quantify the similarities of find inventories, we need to classify the attributes of the material culture that will form the basis for the assessment of similarity and dissimilarity. It is obvious that such a classification is subjective to a great extent, a fact that will surely affect the results. However, this subjectivity can be attenuated by a classification that is as detailed as possible. The more traits to be compared, the more differentiated the correlations and the less room there will be for a subjective weighting of single traits over the other. After the classification of single attributes, we need a procedure that formalises, quantifies and normalises the similarity defined. This is especially the case when we compare data from such different find categories as pottery, pieces of portable art, stone tools, house forms and burial rituals, all thought of as spheres of cultural communication, as associated with differentiable cultural collectives that represent communication intensities in different layers of social reality. These data are not compared straightforward, because they represent different amounts of material and their designs are diverse. Thus, the procedure in demand needs to generate a set of comparable, normalised and formalised similarity data. As a tool I chose correspondence analysis (see Greenacre 1984; Greenacre 1993), because it is able to convert our similarity matrix into a set of relational similarity values, centered around a neutral “0”-point, depending upon the total variance observed and largely independent of the size of the population analysed. This means that we are able to produce normalised similarity data that makes the different cultural layers comparable (see fig. 1 for an illustration). The data will have this form irrespective of the quality and amount of data upon which it has been based. To illustrate the approach proposed here, I will refer to my work on Baden Style Pottery (Furholt 2009). It is an investigation starting from settlement finds that contain Baden style pottery. These are normally called the “Baden Culture”, assuming a cultural coherence that can be easily disproven (cf. Furholt 2008a; Furholt 2008b). Rather, we have to deal with certain stylistic groups of pottery that display a complicated set of parallels and differences between each other and with regard to other contemporary pottery styles. 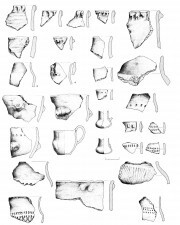 In the study area, reaching from the Carpathian Basin to the northern European Lowlands (Fig 3), seven different pottery styles could be identified. 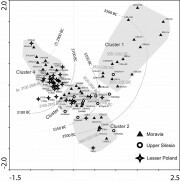 Figure 4 shows the correspondence analysis of the pottery decoration motifs (192 different motifs classified) from settlement material in Moravia, Upper Silesia and Lesser Poland during the time from 3650 to 2900 calBC. Besides an overall temporal trend in axis 1, there is a certain degree of clustering (clusters 1 to 4), indicating discontinuities in the similarity matrix. These are the foundation for the definition of Baden Pottery Styles. This term, however, may be somewhat misleading, as also many pots of the Funnel Beaker and Wyciąże-Książnice styles are included, forming different percentages in the respective Pottery Style. But in the framework of the quantitative approach proposed here, any definition of Pottery Styles or Substyles is totally irrelevant, as in the course of the analysis every unit (that is, every find complex) will be represented by its position in the similarity matrix. Terms such as the reference to styles as “Boleráz” (Cluster 1), “Funnel Beaker with Boleráz Influences” (Cluster 2) or “Late Baden/Bošáca” (Cluster 4) are familiar to every scientist working on the topic and have their right primarily as illustrative tools. 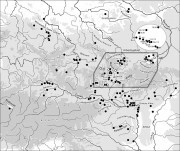 The structures of similarity in pottery were detected for different regions in the Carpathian Basin and north of it (Furholt 2009), but it can be summarised by a supra-regional analysis of decoration motifs (Fig. 5), in which the results from the regional ones could be verified. This analysis provides similarity data for the pottery decoration motifs for the whole area during the time from 3650 to 2900 BC. These pottery decoration motifs have been shown to represent quite well the similarity patterns for the whole vessels (Furholt 2009, 140). Looking at the flint tools, the status quo from which we must start is much less favourable than in the case of pottery. We have hardly any find complexes published in a way that would allow a quantitative analysis by itself. We must rely on descriptions given by Balcer (1988), Kaczanowska (1982/1983), Kaczanowska and Kozłowski (2000), Pelisiak (1991) and Lech (1982/1983). 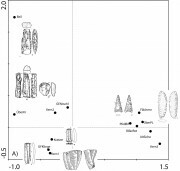 Here, mainly typological features of flint industries are accounted for, hinting at proportions of some distinct traits dominant in different regional units. Thus we have only a semi-quantitative dataset, and it would seem very problematic to compare the cultural spaces denoted by the flint tools with those of pottery. But the normalisation achieved by the correspondence analysis makes these two different layers comparable. Although a better basis for the flint tools would be desirable, we are able to create a working tool that may serve as long as no better data sets are available. Figure 6 shows a result that is very well interpretable, as it displays features already known from the literature and thus plausible. On the right, traits associated with the Alpine Late Neolithic (often associated with pottery of the Altheim, Cham or Mondsee styles, see Kaczanowska/Kozłowski 2000; Uerpmann 1995;Uerpmann 1999), like bifacial heavy retouch and Bavarian Jurassic Tabular Chert, are concentrated. In the lower left are traits like blades and scrapers, characterising the industries south of the Beskides (see Kaczanowska 1982/1983). They are separated from another group of traits in the upper left that can be associated with Polish or Moravian industries like Pietrowice (Balcer 1988). Located between these poles are the units indicating different mixture and interaction processes. Another layer of cultural communication is that of subsistence practices. Surely these are greatly influenced by functional or ecologic determinations. Nevertheless, they will also reflect cultural traditions that can be integrated into a model of cultural communication. At present there is only one category of data widely available: that is the animal bone ratios as summarised by Benecke (1994). He has shown that during the late Neolithic period there is a significant difference between inventories with dominant or very high ratios of sheep and goat bones in the Carpathian Basin versus a dominance of cattle in the areas north of it. This sheep/goat-dominance already starts before the presence of Baden Style Pottery (Furholt 2009, 135): But it then becomes a marked point against the theory of the so-called “Baden Culture” with a coherent setting, because the cultural spaces detectable through the animal bone ratios cut right through the area in which the Baden Style Pottery is present. 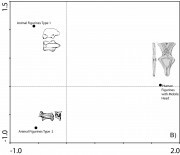 The correspondence analysis for the animal bone ratios is again quite well interpretable (fig. 7). The first axis is mostly dominated by a distinction between domestic species to the left and wild species to the right, where also dog and horse are located. The second axis highlights the difference referred to above, between inventories dominated by cattle or pig and those dominated by sheep and goat. Again we have produced a set of similarity data comparable to those of pottery and flint tools. Clay figurines are quite abundant in connection to Baden Style Pottery. Quite often, the so-called “violin-shaped figurines”, or “figurines with mobile head” are referred to as the typical type of figurine in the so-called “Baden Culture” (see Kalicz 2002; Bondár 2008). Figure 6 presents a map show the three most frequent types of figurines in the time from 3650 to 2900 BC. It is striking that this type of figurine has a very limited distribution, reaching only the central and southern part of the distribution of the Baden Style Pottery. In the northern part, Lower Austria, Moravia, Silesia and Bohemia, these figurines are absent, whereas the depiction of animals dominate. Animal figurines are, on the other hand, very seldom in the greatest part of the Carpathian Basin. Thus, in this layer of communication, again two cultural spaces emerge that have very little to do with the distribution of the Baden Pottery. We may represent this very clear relation by a correspondence analysis, shown in Figure 8. It is obvious that this does not supply us with new knowledge about the setting of the figurines. It does, however, provide us with a set of similarity data comparable to the other layers of communication. Burial rites will form an important pillar for an investigation into the spatial setting of cultural traits. At present we must wait for the publication of the thorough work of C. Sachße (2005), who has studied the chronological and spatial settings the burial rituals connected with Baden pottery (for a summary, see Sachße 2008). Houses are too infrequent to provide a suitable database. Thus, at present we have defined four layers of cultural communication, each provided with a quantified similarity matrix of cultural traits. These are of different quality, und surely in some respects suffer from low or poor representation. But to take an optimistic perspective, the model can only be improved by backing it up with a more abundant database as research goes on. The polythetic classification applied here leads to the preliminary result of several layers, within which different similarity structures in the style of the material culture may be interpreted as proxies for different communication intensities in distinguishable cultural collectives. This goes well along with a culture theory that is explicitly polythetic, disregarding the assumption of cultural coherence as an a priori. The next step will be the examination of the possibilities for combining these layers. This is not very straightforward. It would be thinkable to just combine the similarities of all layers in order to get a summed similarity matrix representing a total of similarity or dissimilarity discernable through the archaeological record. As a heuristic tool this would be fine, but it surely undervalues the different contexts in which cultural communication is embedded. In my opinion, different paths on which to proceed emerge. The first one would be to search for incidences of coherence, thus paying tribute to the classical approach in culture history. A more continuative approach would be the investigation of social context and mechanisms. In the scope of this paper I will mainly concentrate on the first path, while the second one will only be outlined as a perspective for the future development of the approach. This is clearly reminiscent of classical culture history and reminds very much of Clarke’s Analytical Archaeology. We could look for coherent settings of different cultural layers that are basically polythetic, but that may show a certain degree of coherence: coherence that may be caused by political, ideological or economic reasons. Such a setting would be a special case of a cultural space, and it would be the base for an interpretation towards group identities among the individuals involved. Such incidences of coherence may be revealed through a social network analysis. Figure 10 shows a network analysis calculated by the program UCINET (Borgatti/Everett/Freeman 2002). It presents a network analysis of the combined data for pottery, clay figurines, flint tools and faunal remains in the time slice of 3500 to 3350 calBC. The units represented by dots (resp. “nodes” in terms of Social Network Analysis) are formed by the regional groupings already mentioned and indicated in Figure 9 by red hatches. 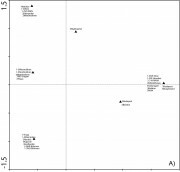 The data of pottery and faunal remains that are available in a much more detailed scale are represented by mean values of the find complexes in the respective regions. The ties between the nodes are graded according to the tie strength that corresponds to the similarity of the two nodes that they connect. The similarity matrix is calculated by a combination of the total eigenvalues of the correspondence analyses for each of the find categories mentioned. This means that the majority of the variances present for each category of material culture is accounted for, and a matrix of total similarity is established that is based upon the similarities and dissimilarities of several polythetically classified layers of cultural communication calculated. However, a weighting has been applied, due to the thought that some realms of cultural communication will be more determined by natural and functional means than others. For this reason the similarities of the pottery decoration and the clay figurines are counted twice to account for their higher potential in transmitting cultural meanings. This simple procedure substitutes more elaborated models yet to be developed. If there would be incidences of cultural coherence, there should be subgroups visible in the network. Where the different layers show divergent settings, such clear groups should not be visible. In fact, Figure 10 does display an incidence of cultural coherence, or at least coherence of one cultural border. The graph has two subgroups very loosely connected. As our dataset is limited to the Carpathian Basin in the south, we do not know how large the southern subnetwork would be, but the delineation to the second group in the north is quite clear. The second subgroup in the centre is much more closely connected to the rest of the network in the north, indicating a lesser degree of coherence in this case. The tool of social network analysis provides the possibility for measuring the degree of coherence in a network as well as in the subnetworks, and, thus, we may again compare different historical situations. However, to play out this strength of the method, we would need more examples to work with. Thus, we will leave this aspect aside and rather return to our example in Figure 10. The traditional view that is very much determined by pottery sees the southern and central group as one cultural area – denoted by the term “Baden Culture”, while the polythetic classification and the network analysis point to a different interpretation. Although the (Early Baden-) Boleráz-Pottery do dominate in both regions, the other cultural layers show a different structure that seems to be dominated by a situation that was present before the spread of Boleráz-Pottery to the North (see Furholt 2009 and below). It can be easily shown that this pattern is observable in the archaeological record, remembering the settings of clay figurines and animal bones referred to above. When we proceed to the next time-slice, 3350 to 3100 BC, Figure 11 shows a network analysis that is clearly divided into two subgroups. The biggest part of the network displays a structureless clump of similarities that seems to indicate a very low degree of coherence. In this period, different styles of the classical Baden Pottery show a very distinct spatial pattern, witnessing a regionalisation of the traditions in pottery production (Furholt 2009), supposedly opposed to the widespread distribution of the Boleráz-Style in the period before. This regionality cannot be found in the other cultural spheres analysed. A marked exception is the region of southern and central Hungary. Here, we again witness a case of coherence, where the realms of pottery production, flint knapping traditions, animal breeding and clay idols cover a corresponding area. Again this is true only for the delineation towards the north, as in the south our investigation area limits the network. It is, however, striking that, looking at our archaeological maps, the area covered by the Classical Baden Pottery Style 6 (Fig. 12) corresponds to Banner’s (1956) “Group of Skeletal Graves”. In this area figurines with mobile head dominate as well as settlements with a dominance or high proportion of sheep and goat bones. But both of these last mentioned phenomena seem to continue southeastwards, forming a part of larger southeast European traditions. Nevertheless, it is tempting to interpret such an area with a high degree of coherence in material culture as the reflection of group identities. However, some caution must be taken. When we talk about group identity, we inevitably approach the problem of ethnicity. Coherence in material culture is primarily in reference to an intense communication among the individuals participating in the network and a more or less abrupt break in communication outwards. This may be caused by economic or ecological means as well as ideological reasons. As ethnicity only works as a self-attribution (following Weber 1922, 303-311; esp. 307), it is archaeologically not detectable. Thus, the thought of a culturally coherent social group represented by a set of more or less coherent material culture from different material categories is tempting, although quite simplistic. We know from anthropology that ethnic groups in traditional, pre-state societies seldom exceed a range of 3000 square kilometres (Wotzka 1997), an area much surpassed by our Hungarian example. Moreover, the cultural realms recorded in our example are only a small extract from past cultural reality. As we know from anthropology, it is unpredictable which parts of material culture, if any, really communicate group identities in a given case (see; Barth 1969, 119; Hodder 1982 35; Sommer 2003, 212); Wotzka in print). At most we could speak of a higher probability of the presence of a human identity group in the single cases in figures 10 and 11. And our investigation does not provide evidence for the absence of human identity groups in areas, in which we cannot detect coherence in material culture. The search for group identity via archaeological data always seems to lead to a dead end. It is, of course, important to detect areas of intense cultural communication in contrast to marked cultural borders. But this should not lead us towards the definition of a new set of “Archaeological Cultures”. Surely these would be much better founded than the traditional ones, and it is conceivable that static units of classifications have their heuristic values. But the fixing of such static units will inevitably lead to the underestimation of gradual differences and dynamics in time and space, the detection of which actually mark the greatest strength of the quantitative approach described. Rather we should proceed to describe the patterns of cultural communication in its spatial and temporal variation and in regard to the social context, in which it takes place. As we have spatially modelled communication intensities, we can compare patterns of cultural interactions that are connected to specifiable social contexts. Above, following the polythetic classification and culture theory, we stated that the different categories of the archaeological record could be viewed as differentiable cultural spheres, associated with different cultural collectives. These collectives are defined as individuals communicating in the course of a specific social purpose or value. These values or purposes are dependent upon the overall social structure and mode of social production. This means that we will be able to compare the patterns of communication among cultural collectives present in one society. As an example, the communication patterns reflected by the fine ware (assumedly of high status) in Boleráz pottery in the early Baden phase (3650–3350 BC) are very different from those reflected by the mostly domestic coarse ware, as has been shown elsewhere (Furholt 2008b, 623ff.). Cultural choices of economic strategies are connected to other aspects of the social system and to functional needs (Furholt 2009, 133ff. ), and, thus, they again show a very different setting. The same is true for flint technologies (Furholt 2009, 106ff.) and for burial rituals (see Sachße 2008). A highly dynamic picture will emerge. The point is that we must be explicit about the social model that we apply to the material that we examine. When we have such a model, our quantifications of cultural communication patterns may help us to understand the connections between a vertical social structure and spatial cultural behaviour. What is more, when we compare different societies in different social organisational and economical systems, we will be able to compare the changing interrelations of economic systems, social systems and spatial cultural behaviour. It is common knowledge that there are marked differences in spatial behaviour, depending upon the specific social and political systems. But the application of formalised quantified similarity data of the spatial cultural behaviour will allow us a much more systematic approach in describing and analysing these questions. B. Balcer, The Neolithic Flint Industries in the Vistula and Odra Basins. Przegląd Archeologiczny 35, 1988, 49-100. J. Banner, Die Péceler Kultur. Archaeologia Hungarica 35 (Budapest 1956). F. Barth, Pathan Identity and its Maintainance. In: F. Barth (Hrsg. ), Ethnic Groups and Boundaries (Boston 1969) 117-34. N. Benecke, Archäozoologische Studien zur Entwicklung der Haustierhaltung in Mitteleuropa und Südskandinavien von den Anfängen bis zum ausgehenden Mittelalter. Schriften zur Ur- und Frühgeschichte 46 (Berlin 1994). M. Bondár, The Paraphernalia of Cult Life in the Late Copper Age. Acta Archaeologica Academia Scientiarum Hungaricae 59, 2008, 171-81. P. A. Burrough/R. A. McDonnell, Principles of Geographical Information Systems (Oxford 1998). V. G. Childe, The Danube in Prehistory (London 1929). D. L. Clarke, Analytical Archaeology (London 1968). A. Endrődi, Adatok Békásmegyer őskori telepuléstörténetéhez: a késő rézkori bádeni kultúra települései és temetkezései. Budapest Régiségei 35, 1, 2002, 35-75. M. Furholt, Culture History Beyond Cultures: The Case of the Baden Complex. In: M. Furholt/M. Szmyt/A. Zastawny (Hrsg. ), The Baden Complex and the Outside World [Proceedings of the 12th Annual Meeting of the EAA 2006, Cracow]. Studien zur Archaeologie in Ostmitteleuropa/Studia nad Pradziejami Europy Środkowej (SAO/ŚPES) 4 (Bonn 2008a) 13-24. M. Furholt, Pottery, Cultures, People? The European Baden material re-examined. Antiquity 82, 2008b, 617-28. M. Furholt, Die nördlichen Badener Keramikstile im Kontext des mitteleuropäischen Spätneolithikums (3650-2900 v. Chr.). Studien zur Archäologie Ostmitteleuropas 3 (Bonn 2009). M. J. Greenacre, Theory and Application of Correspondence Analysis (London 1984). M. J. Greenacre, Correspondence analysis in practice (London 1993). K. P. Hansen, Kultur und Kulturwissenschaft. UTB 18463 (Tübingen, Basel 2003). I. Hodder, Symbols in action. Ethnoarchaeological studies of material culture. New Studies in Archaeology (Cambrigde, London, et al. 1982). S. Jones, The Archaeology of Ethnicity. Constructing identities in the past and present (London/New York 1997). M. Kaczanowska, Z badań nad przemysłem krzemiennym kultury ceramiki promienistej. Acta Archaeologica Carpatica 22, 1982/1983, 65-96. M. Kaczanowska/J. K. Kozłowski, Umwandlungen in den spätäneolithischen Steinindustrien im mittleren Donaugebiet. In: S. Kadrow (Hrsg. ), A Turning of Ages. Im Wandel der Zeiten. Jubilee Book Dedicated to Professor Jan Machnik on his 70th Annerversary (Kraków 2000) 239-55. N. Kalicz, Eigenartige anthropomorphe Plastik der kupferzeitlichen Badener Kultur in Karpatenbecken. Budapest Régiségei 36, 2002, 11-53. J. Lech, Flint Work of the Early Farmers. Production Trends in Central European Chipping Industries from 4500-1200 B.C. An Outline. Acta Archaeologica Carpatica 22, 1982/1983, 5-63. J. Lüning, Zum Kulturbegriff im Neolithikum. Praehistorische Zeitschrift 47, 1972, 145-73. J. Lüning, Über den Stand der neolithischen Stilfrage in Südwestdeutschland. Jahrbuch des Römisch-Germanischen Zentralmuseums Mainz 26, 1979, 75-113. N. Müller-Scheessel/S. Burmeister, Einführung: Die Identifizierung sozialer Gruppen. Die Erkenntnismöglichkeiten der prähistorischen Archäologie auf dem Prüfstand. In: S. Burmeister/N. Müller-Scheessel (Hrsg. ), Soziale Gruppen-kulturelle Grenzen. Die Interpretation sozialer Identitäten in der Prähistorischen Archäologie. Tübinger Archäologische Taschenbücher 5 (Münster, New York, München, Berlin 2006) 9-38. J. Müller, Soziochronologische Studien zum Jung- und Spätneolithikum im Mittelelbe-Saale-Gebiet (4100-2700 v. Chr.). Vorgeschichtliche Forschungen 21 (Rahden (Westfalen) 2001). O. Nakoinz/M. Steffen, Siedlungshierarchien und kulturelle Räume. In: D. Krauße (Hrsg. ), Frühe Zentralisierungs- und Urbanisierungsprozeße. Zur Genese und Entwicklung frühkeltischer Fürstensitze und ihres territorialen Umlandes. Kolloquium des DFG-Schwerpunktprogramms 1171 in Blaubeuren, 9.-11. Oktober 2006 (Stuttgart 2008) 381-98. C. Orton, Sampling in Archaeology (Cambridge 2000). A. Pelisiak, Ze studiów nad wytwórczością kamieniarską w kręgu kultury badeńskiej. Acta Archaeologica Carpathica 30, 1991, 17-54. C. Sachße, Untersuchungen zu den Bestattungssitten der Badener Kultur in ihrem räumlichen und zeitlichen Umfeld. Dissertation (Universität Heidelberg 2005). C. Sachße, Baden Cultural Identities? Late Copper Age Funerals Reviewed. In: M. Furholt/M. Szmyt/A. Zastawny (Hrsg. ), The Baden Complex and the Outside World. Studien zur Archäologie in Ostmitteleuropa 4 (Bonn 2008) 49-68. S. Shennan, Introduction: Archaeological Approaches to Cultural Identity. In: S. Shennan (Hrsg. ), Archaeological Approaches to Cultural Identity (London 1989) 1-32. S. Shennan, Quantifying Archaeology2 (Edinburgh 1997). U. Sommer, Materielle Kultur und Ethnizität - eine sinnlose Fragestellung? In: T. K. Ulrich Veit, Christoph Kümmel, Sascha Schmidt (Hrsg. ), Spuren und Botschaften: Interpretationen materieller Kultur. Tübinger Archäologische Taschenbücher Band 4 (Münster, New York u.a. 2003) 205-23. M. Uerpmann, Flints of the Cham Culture. In: B. S. Ottaway (Hrsg. ), A Changing Place. The Galgenberg in Lower Bavaria from the fifth to the first millennium BC. BAR International Series 752 (Oxford 1999) 175-98. M. Weber, Wirtschaft und Gesellschaft. Grundriss der verstehenden Soziologie. Reprint Neu-Isenburg 2008 (Tübingen 1922). H.-P. Wotzka, Zum traditionellen Kulturbegriff in der prähistorischen Archäologie. Paideuma 39, 1993, 25-44. H.-P. Wotzka, Maßstabsprobleme bei der ethnischen Deutung neolithischer „Kulturen“. Das Altertum 43, 1997, 163-76. H.-P. Wotzka, Aspekte des traditionellen archäologischen Kulturbegriffs in der Forschung zum mitteleuropäischen Neolithikum. Unpublizierte Habilitationsschrift (Frankfurt am Main, in print). Furholt, M. "Quantifying Spatial Similarity Patterns in Material Culture: The Baden Complex in a Polythetic culture model." 26 Sep. 2009. In: Horejs, B. - Pavúk, P. (eds. ): Aegean and Balkan Prehistory. http://aegeobalkanprehistory.net/index.php?p=article&id_art=17 (24 Apr. 2019).